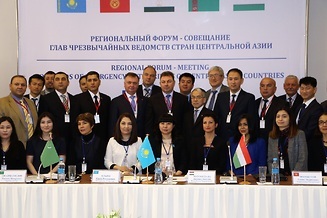 On 27 April 2018, a Regional Ministerial Meeting of the Heads of Disaster Management Authorities of Central Asian countries took place in the Center for Emergency Situations and Disaster Risk Reduction (CESDRR) in Almaty, Kazakhstan. During the event, the participants agreed to strengthen regional cooperation in disaster risk reduction (DRR) and emergency situations and to establish a Regional Scientific and Technical Advisory Board. Heads of disaster management authorities of Central Asian countries, experts in the field of civil defense and representatives of international organizations active in DRR in the region participated in the event. The main objective of the meeting was to discuss regional cooperation and how to strengthen the capacities of the Central Asian countries to effectively respond to potential emergencies, including transboundary disasters, which cannot always be carried out by resources of one single country only. One of the discussion items was devoted to the establishment of a Regional Scientific and Technical Advisory Board for DRR and Emergency Situations. It is expected that the Advisory Board will be composed of a pool of experts to assist in strengthening regional scientific and technical cooperation in Central Asia, including with the international and non-governmental organizations and scientific institutions studying natural hazards. As the UN Agency focusing on the application of science and technologies to DRR, UNESCO supports the establishment of the Advisory Board and will participate in the future Advisory Board’s activities. The activities of the Advisory Board are proposed to be carried out through the support of international organizations, including in the framework of implementing various programmes and projects. At the same time, the organizational and technical support of the future Council will be provided by the CESDRR in Almaty. 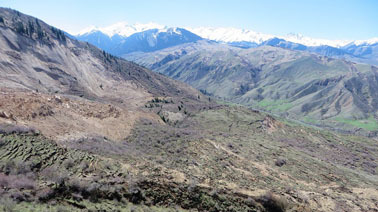 The Central Asia region, which is home to more than 70 million people, is prone to various natural disasters, including earthquakes, mudflows, landslides, floods and others. The decisions taken at this regional meeting will contribute to strengthening the capacities of Central Asian countries to effectively respond to large-scale, including transboundary, emergencies in the region.